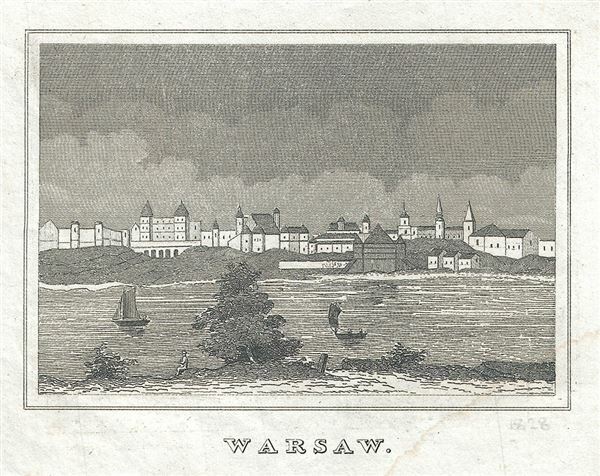 This is a charming 1828 view of Warsaw, Poland. It features the capital city of Poland as viewed from across the Vistula River. Having survived several wars and rebellions, Warsaw is also known as the 'phoenix city.' The illustration features ships sailing the Vistula River with a tree and man in the foreground, while various buildings are visible in the background. Very good. Minor dampstain bottom right quadrant.